Apologies! 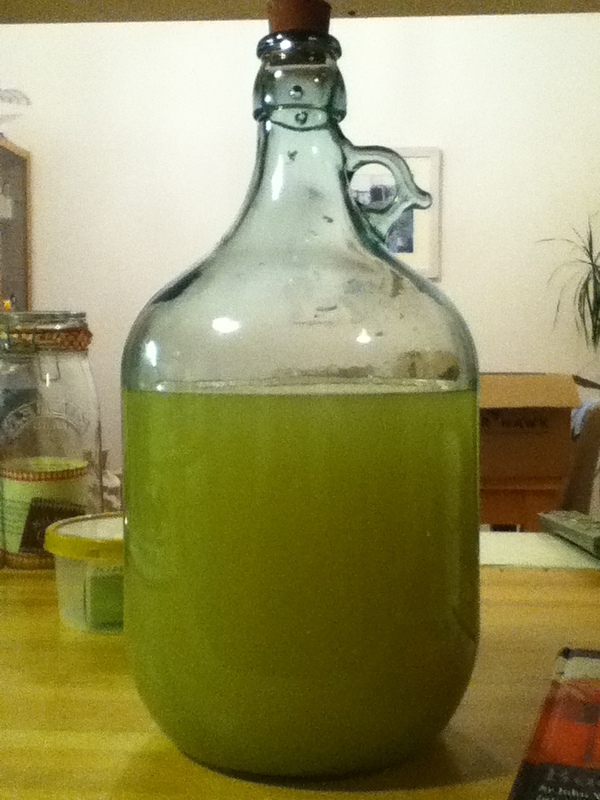 This is not a beer post, but I had a Twitter request to blog my ginger wine and had no where else to put it. Disclaimer over! Knowing me well as my family do, I was bought quite a few alcohol-related books for Christmas last year. Excellent news! One of these was John Wright’s Booze, Volume 12 of the River Cottage Handbook series. The writing style’s very conversational and, for me, skirting uncomfortably close to be annoying most of the time. The fella seems to know his was around brewing booze at home, though, and that’s recommendation enough for me. I’ve very much enjoyed having the book. Beer does seem to be less his thing and the book has turned my head a bit and got me looking at the other chapters. Specifically those on infusions and wine. Now I’m impatient enough when waiting a few weeks for my beer to condition, so I was quite shocked to see that Wright recommends a year or more before his wine recipes would be ready to drink. It certainly made me think I’d better get on with this if, as planned, I wanted to be able to give some bottles of ginger wine away as Christmas presents. So,strange as it was to be preparing for Crimbo in February, ginger wine was made in the following way (very close to Wright’s recipe). 50g of peeled and grated ginger was mixed in a large saucepan with 1.5kg of sugar and 4.5l of water. This was boiled for 30 mins. 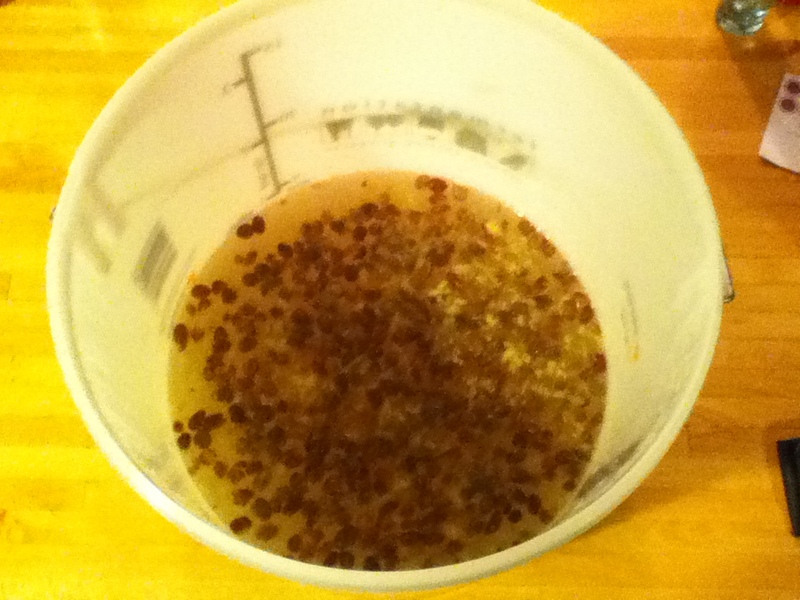 Once boiled, the mixture was poured over 100g of washed and chopped raisins in a fermenter. Once cool, the zest and juice of 2 lemons was added. The must was sealed up and left alone for 2 days. After that, I stirred in 1tsp yeast nutrient and pitched some white wine yeast. This was then left for 5 days, stirring every day. After a day’s rest, the majority of the liquid was siphoned into a demijohn. The remainder was strained in through a sieve and a funnel. After half an hour or so, there was a lot of airlock activity. So we are in business! For info, the original gravity was 1120 and was down to 1098 after the week. No idea what it will ferment down to, let’s see. The process was really quite easy and, having had a cheeky taste while transferring, it’s tasting really promising. Still VERY sweet, but beautifully lemony as well. Not so much ginger really, but maybe that’ll come in time or as the wine becomes a little drier. Looking forward to tasting this one properly NEXT winter. After two months in primary, and with fermentation seeming to have stopped, I racked this to a fresh demijohn for clearing (and potentially finishing off if there’s still a little more work for the yeast to do). I took a hydrometer reading of 1060, which puts it at 8% abv. I don’t know what I was expecting gravity-wise, but this instinctively feels a little high to me and it is still rather sweet, but perhaps this is how it’s meant to be. Plenty of time anyway, so will leave it in a demijohn with airlock for a month or so and see what happens before bottling. It tasted very sweet and sharp with lemon and ginger, actually really happy with how both flavours are coming through now. Should make palatable winter drinking anyway. This entry was posted in Uncategorized and tagged Christmas presents, Wine on February 26, 2014 by bagboilbeer. Following the seeming success of BIAB#1, we were keen to get cracking and put another brew on. Apologies to all of you who I’m sure have been eagerly awaiting this update, but this was actually brewed over a week ago… just not got around to blogging it until now. For anyone who could be bothered to read it, you’ll know that the BIAB#1 post was long (sorry!) This was because it was pretty heavy on the process of our approach to brewing in a bag. I won’t spend so much time dwelling on all that this time. Unless specifically referred to, we followed the same process as last time. As we had finished down on volume last time (only collecting 9 litres of wort post-boil), we upped the water quantities for mashing to 6 litres and sparging to 9 litres (from 5.5 and 8 litres respectively). There was no science or maths involved in any of this, more of a ‘lets just add a bit more’ decision really! The extra water worked too well. We ended up with our pan absolutely full to the brim at the start of the boil (see below), with around a litre left over that we couldn’t squeeze in. Despite as much topping up as we could get away with through the boil, we ended up not being able to use all of the wort. Next time, we think we’ll scale back the volume of sparge water a little and see how we finish up. Certainly lots of fine tuning still to be done. After the 60 minute boil, we cooled it to around 15C as quickly as possible and got a hydrometer reading of 1054. This was, by some kind of strange miracle, exactly our intended Original Gravity. It tasted very sweet and had a lot more visible sediment than our previous brew, so it’ll be interesting to see how it turns out on that front. The great news, and again some kind of divine intervention must have been involved, we got pretty much spot on 10 litres this time. Got to be happy with that as a result. In a situation of some farce, having pitched Safale S-23 Lager Yeast the FV was then driven (VERY cautiously) to Jono’s house, as he’s nobly offered to turn off the central heating in one of his rooms so that we can get a good lager fermentation temperature (aiming for 14-15C). That’s commitment for you! Happy to report that one week in, there’s been plenty of activity in there. Soon we will have lager. The other major issue that we had last time was holding temperature for the duration of the mash. Thanks to advice from @100yojimbo, @RLemkin & @sumofallbeer, the most likely-sounding workaround for this was to preheat the pan in an oven and to keep it in there, on a low heat, for the duration of the mash. Can only imagine that would work really well, but unfortunately this isn’t an option for us as the pan isn’t oven proof. So it’s mass insulation all the way, it seems. 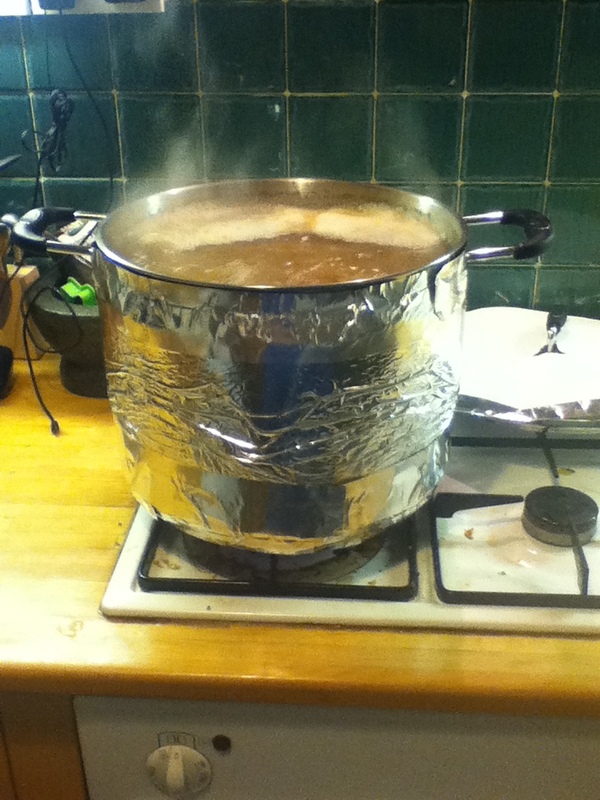 Despite valiant efforts to insulate the pan, and plenty of other tips picked up in response to our last blog on this very subject (thanks to @_davidmchugh, @FourStringDave & @Lugsy51), we still really struggled to hold a good, high temperature. We did only need to put it back on the heat once – a definite improvement – but we will need to insulate further, I think. Watch this space for updates on that… I bet you can’t wait! So, that’s BIAB#2 underway and we will hopefully have some lovely, refreshing lager for all those baking hot days that are doubtless just round the corner. Next brew – and notes on the first proper taste of BIAB#1 – coming soon. First tastings of the lager have happened over the last week and we#’e really quite happy with it. It’s perhaps a little too sweet ,and could have had both a drier taste and mouthfeel, but it’s tasty, super refreshing and has been great in the sunshine. Additionally, we took 2 litres from the main batch and bottled this in a couple of big bottles with a strip of burnt orange in each. We popped one of these over the weekend and it was really nice with that little bit of citrus too, just a shame we only have one bottle left of that. All in all, we’re counting this as a success. Let’s see what others make of it. 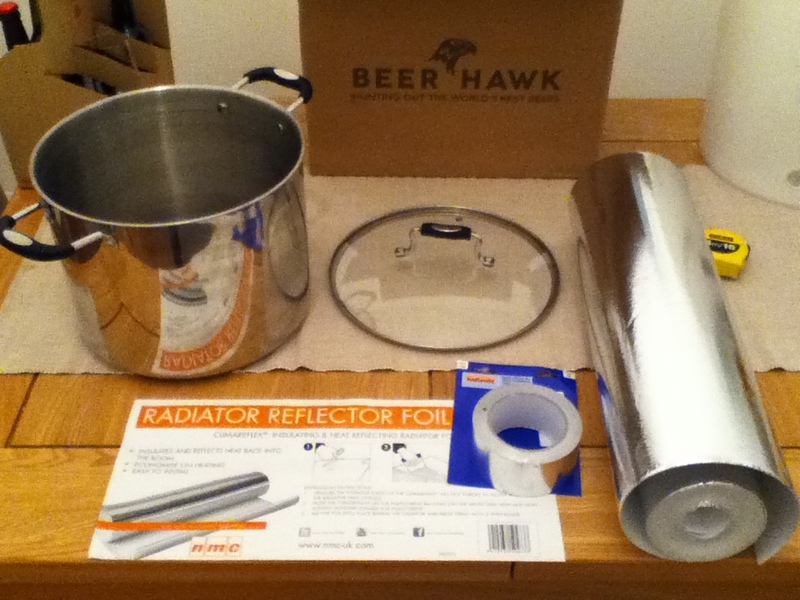 This entry was posted in Uncategorized and tagged BIAB, homebrew on February 25, 2014 by bagboilbeer. BIAB#1 went almost worryingly well. 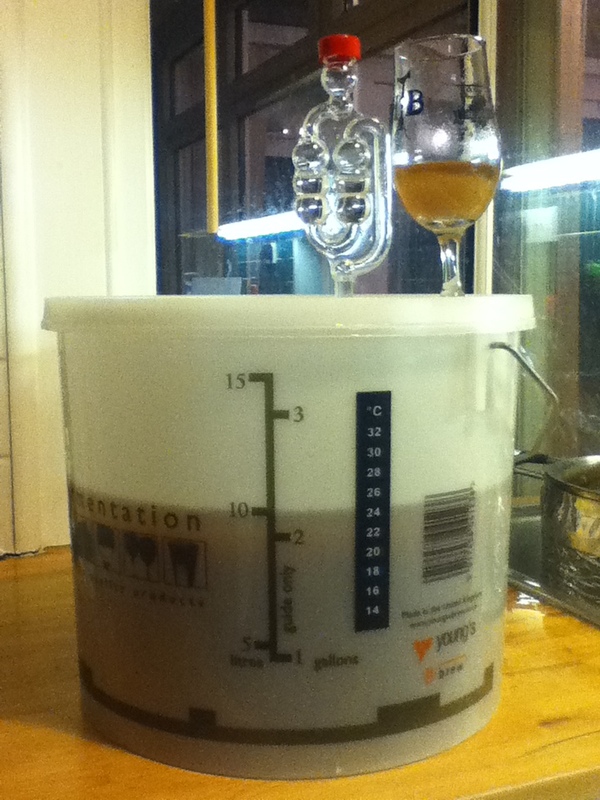 It looked like stout, the airlock bubbled and, two weeks on, has fermented down to 1010. Result! A quick taste while bottling also suggests we’re on to something that’s a big step up in quality from the kits we’d been brewing previously. No ‘twang’, clean tasting, really promising. So far, so positive. There’s no way we’re going to start getting complacent after just one brew, though. Oh, no! The big issue from the first brewday was that the pan we’re using as a mash tun has no insulation and our attempt to counter this by wrapping it up in a blanket wasn’t nearly good enough. So, alongside planning our next brew (which will be a lager, by the way), our thoughts turned to how best to insulate the pan. 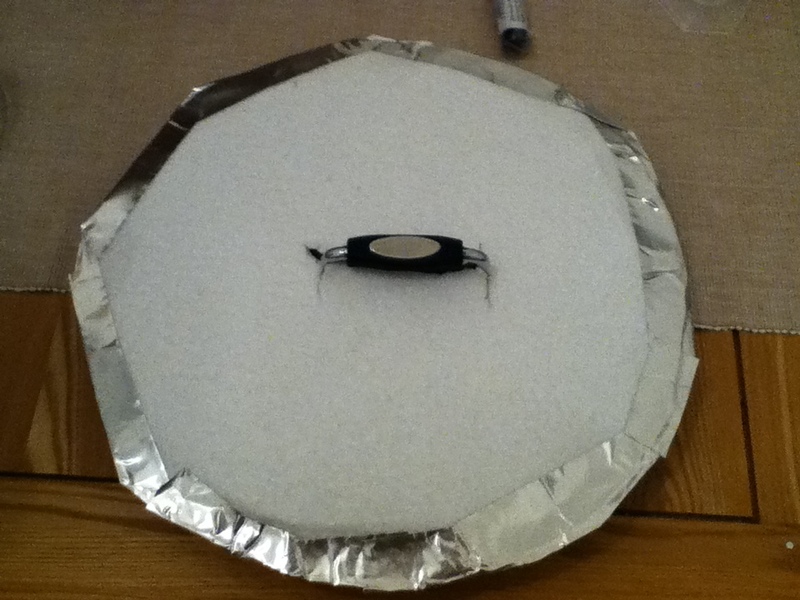 Jono sourced aluminium radiator reflector foil, some heat resistant tape and we were ready to go. 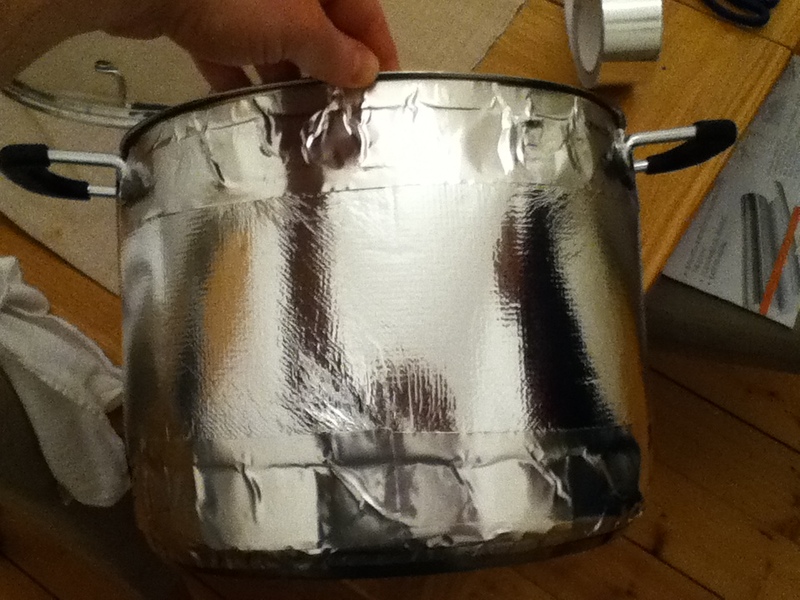 We taped a totally arbitrary 3 layers of foil to the outside of the pan. It didn’t look so pretty anymore, but it was still shiny so that’s something. Pan bundled up to keep it nice and warm. Hopefully. As we are nobody’s fools, we also remembered to make the pan a decent hat to go along with it’s nice, new, cosy jacket. This was, again, 3 layers of foil which we reinforced with cardboard. Following a good half an hour’s work, we had our finished product and were ready to wrap it back up in the blanket and put it through its paces. 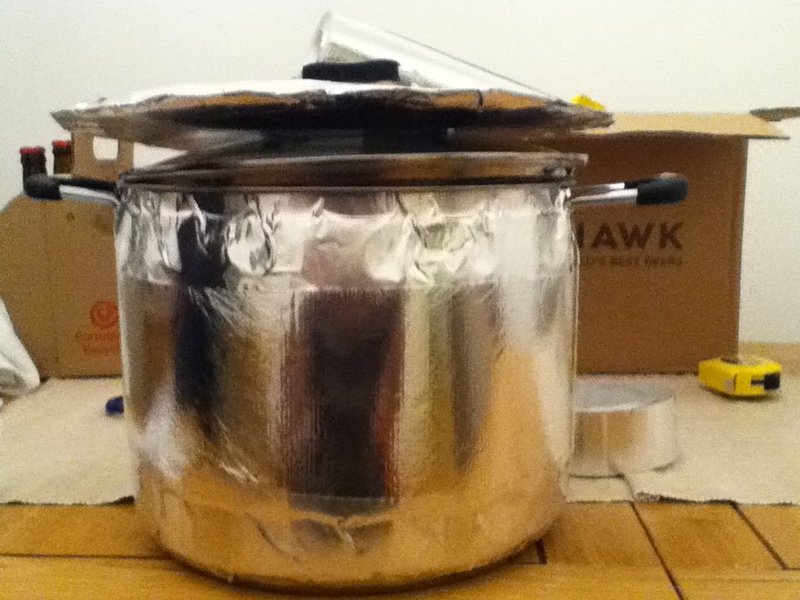 One pot, insulated to make it a more effective mash tun. The delight we had in our efforts was soon crushed, though. 7 litres of 72C water lost 10 degrees across an hour. This was a slight improvement on previously, but nothing like as much as hoped. Devastating! Rather than tear all the foil off and rush back to the drawing board, we’ll push ahead with the new look pan for the next brew. The hope is that when the grain bags are in and the pan is full – with dead headspace reduced – the rate of heat loss will improve. We’ll get it next to a radiator and, if necessary, we can just top up with some boiling water (thanks @FourStringDave). Hopefully all that will mean we can hold a decent high mash temperature. If we come up with a better solution, then we’ll post that here. Any suggestions for other things we could try would be great too. Next brew (lager) should be going on Saturday, 15th February. This entry was posted in Uncategorized and tagged BIAB, homebrew on February 11, 2014 by bagboilbeer.